Cambodia’s Sihanoukville Autonomous Port (PAS) has launched operations at its new multipurpose terminal, paving the way for larger ships to call. However, while the expansion at the country’s only deepsea facility could help bring down logistics costs, Cambodia’s exports remain at risk from its government’s lurch toward authoritarianism. Located 230km south-west of capital Phnom Penh, Sihanoukville handles 70% of Cambodia’s container traffic. Driven by booming garment exports and strong Chinese investment into the port city, throughput has increased by double-digits for the past five years, averaging 12.6%. The port handled 459,835 teu in 2017 and recorded 207,047 teu for the first five months of 2018, up 20% year on year. The new terminal, funded by Japan to the tune of US$74m, has a 330-metre berth and 13.5-metre draught and is intended for both bulk and container vessels. PAS says the terminal can handle shipments weighing 50,000 tonnes, double that of the other facilities. “There is indication from the shipping lines that they will bring in bigger-capacity vessels if demand keeps growing,” said Pich Ngun, managing director of Scan Global Logistics Cambodia. He said volumes usually peaked from June to September, as well as the year-end period, which puts pressure on available capacity out of the major South-east Asian transhipment hubs. “Rates are increasing as space is tight, but also because of the rising oil price which forced shipping lines to apply surcharges,” said Mr Ngun. 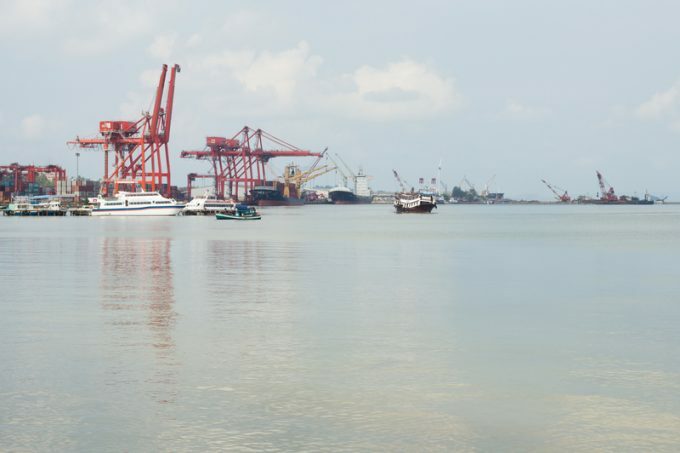 PAS is banking on the continuation of Sihanoukville’s current growth trajectory, with work on a new $203m container terminal commencing next year. That facility will bring port capacity up to 700,000 teu by 2022. While this terminal is also funded by the Japanese International Cooperation Agency, Chinese investment is behind a $2bn, 190km expressway connecting Sihanoukville to Phnom Penh. “This is very positive, as the highway will greatly improve inland logistics and transportation costs,” added Mr Ngun. China is also funding Sihanoukville (SEZ), an 11 sq km special economic zone that has so far attracted 121 companies, 104 of which are Chinese. “We have already seen many investors from China there and, as we all know, China’s production costs are increasing, so more and more Chinese factories have to move out to South-east Asia. “Cambodia has one of the closest friendships with China, giving it the edge over Vietnam, Laos and Myanmar, and Vietnam’s relationship with China is not good due to the conflict over the South China Sea. Laos is too small, with no sea port for exports and Myanmar still has a lot of work to do to convince foreign investors,” Mr Ngun claimed. However, while he is upbeat about Cambodia’s growth prospects, Mr Ngun said crucial access to Western markets could be in jeopardy if Cambodia’s next government failed to receive US and EU support after elections on 29 July. Prime minister Hun Sen, in his 34th year in office, faced heavy criticism after his government dissolved the main opposition party. European and American politicians have since threatened Cambodia with sanctions and an end to tariff exemptions. The EU and the US respectively represent around 40% and 35% of Cambodia’s $10.1bn export volumes. By comparison, Japan and China represent just 10% and 6%.